Which disposable glove should you use? There are several choices of food safety disposable gloves available, and our comparison chart helps you choose the best glove to suit your business needs. We compare quality, value, potential user health issues and environmental impact -- all factors that could affect food safety and business risk. Eagle supplies the highest quality and responsibly sourced products to protect you and your business. Our most popular nitrile glove - shown to have 3x less cross-contamination potential as vinyl gloves. 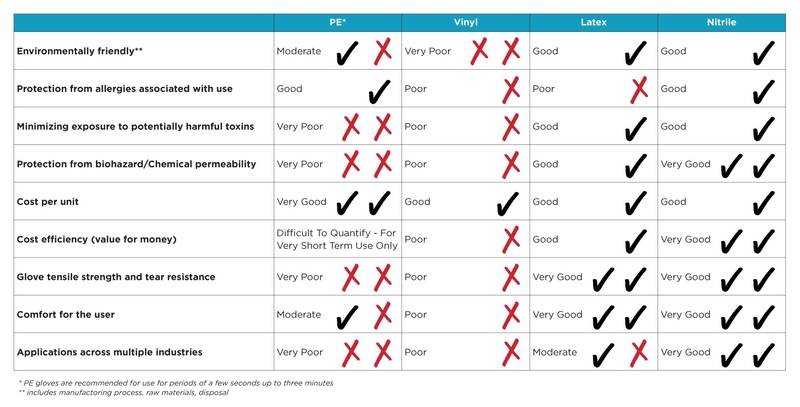 Click below to download the glove type and Eagle Proptect product comparison charts.